Scarce early engraving of the Declaration of Independence. ELEAZER HUNTINGTON. Engraved Document. Ca. 1820-1825. 20 x 24½ in. In the period following the War of 1812, Americans began to look back for the first time on the nation’s founding; the Republic was forty years old, and the generation that had signed the Declaration of Independence was passing away. Many founding documents, such as the debates of the Constitutional Convention, had not been widely published. 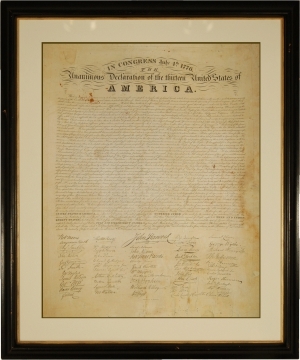 Even the Declaration of Independence itself, as created, was largely unknown to Americans. Several entrepreneurs, sensing the national mood, set out to print reproductions of the document. The first to do so was a writing master named Benjamin Owen Tyler, who created a decorative version of the Declaration and published it in 1818. Then, in the early 1820s, a Hartford engraver and penmanship author named Eleazer Huntington followed Tyler’s example by creating a calligraphic facsimile of the Declaration. Huntington striped out the ornaments and illustrations that Tyler had added, and reduced the size to make it more affordable.